Green Lanterns is the most improved title of DC’s Rebirth initiative. It began with a lackluster story focused on the Red Lanterns that was dragged down by very inconsistent artwork, but then the series slowed down, delved deeper into the personal lives of main characters Simon Baz and Jessica Cruz, and cleaned up the visuals, resulting in a very quick increase in quality. 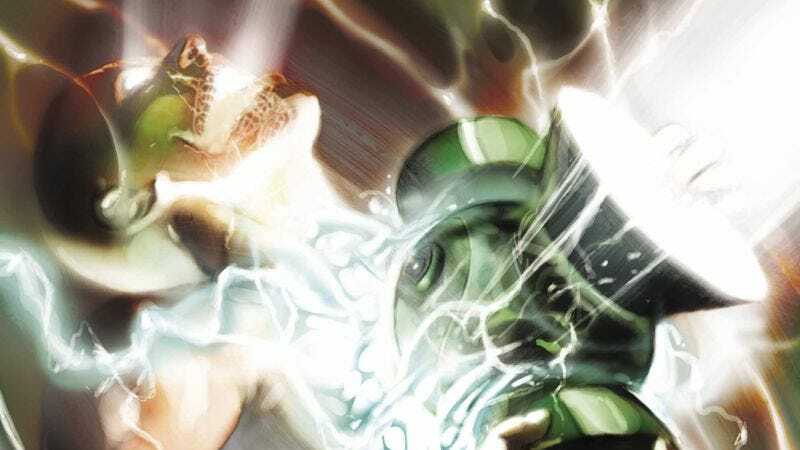 With the Green Lantern franchise so heavily focused on space opera after Geoff Johns’ nine-year run, writer Sam Humphries is offering a refreshing take on the Green Lantern concept by keeping Simon and Jessica grounded on Earth. Humphries has spent a lot of time exploring the individual fears and anxieties of his main characters, and the most recent storyline, “Darkest Knight,” was the book’s most enjoyable arc yet as the Green Lanterns teamed up with Batman to take out a supercharged Scarecrow in Gotham City. Next week’s Green Lanterns #18 shifts away from Simon and Jessica to explore the origin of Volthoom, The First Lantern. He’s been plotting in the background of this series for a while now, and next week’s issue fleshes out the villain by looking at his path to the dark side. Original series artist Robson Rocha returns to the book with #18, and he’s joined by a new inker and colorist that make his art look better than ever. Inker Daniel Henriques does great work adding more weight to Rocha’s linework, and colorist Alex Sollazzo is amplifying the texture and the contrast to give the art more dimension. These are some of the best pages Green Lanterns has had in its entire run, heightening the spectacle and increasing the scope of the action as the series goes off-planet to give readers a better understanding of the series’ Big Bad.